The zed manages two steps from the manhole before a stream of bullets blast it off its feet. More bullets tear into it in midair, splattering blood across the street and unburdening its gut of a generous helping of internal organs. Everyone in the dark conference room at Tripwire Interactive laughs or oohs as they watch the most complicated gore system in gaming—a gore system they've been building for Killing Floor 2 for the past two years—eviscerate the zed in a way they've never quite seen before. "This project on an animation end has been a dream come true for me," he says. “This is the first time we had the budget for me to do mocap for everything and try to make everything look as sick as possible." When Munk says everything, he means it. The gun animations are mocapped. Melee is mocapped for first- and third-person perspectives. Killing Floor 2 is still a simple game. But this time, it looks good . 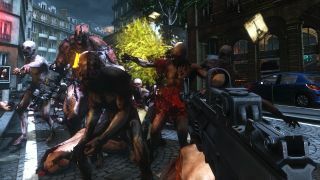 "[Killing Floor 2] is the first time we've been able to develop a game from start to finish with what I would call a reasonable size staff and a reasonable size budget," says John Gibson, Tripwire's president and a co-founder along with Munk.